The Letoön is a shrine that was dedicated to the goddess Leto and her two twins: Apollo and Artemis. The two were conceived by Zeus and were born on the Island of Delos Because of the jealousy of Hera, the wife of Zeus, Leto fled to this spot to wash her children in the spring—the water table is very close to the surface here! The site has been well-excavated by a French team and temples to Leto, Apollo, and Artemis have been discovered along with a Nymphaeum, Byzantine Church, and a Hellenistic Theater. A very important tri-lingual inscription (Greek, Aramaic, and Lycian) was found here. 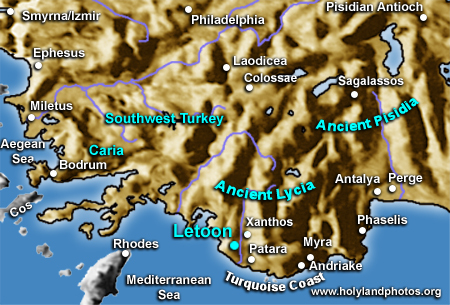 The Letoön was a central sanctuary for the Lycians and not really a "city" as such.